South Georgia has rightly been called ‘the greatest wildlife show on Earth’ and after our in depth exploration of this remote island in the South Atlantic, we are certain you will agree. This seldom-visited corner of the planet is a place we know intimately and look forward to visiting every season. Even our experienced expedition staff, some with more than 100 journeys into the polar regions, cherish every visit to South Georgia. It really is that remarkable. Traditionally, our visits to South Georgia last only three or four days and are part of a much longer itinerary that also includes Antarctica. However, after many years of careful preparation and planning, we now offer the unique opportunity to spend eight full days of exploration. This is more than double the time traditionally spent exploring South Georgia. This particular departure is timed to coincide with the arrival of spring in the Sub-Antarctic region. Early November marks the beginning of the wildlife migration and commencement of the breeding cycle for many species. Scenes of male elephant seals battling for control of the beaches (and the female harems), the intimate and beautiful courtship rituals of the albatross and antics of the young penguin chicks, will have you believing you are 'on the set' of your very own wildlife documentary. While the soft light in the mornings and evenings adds to the colour palette for the photographers at this time of the season. For lovers of remote, small-ship expedition cruising, this voyage ticks all the boxes. We depart Santiago this morning on our special charter flight direct to Stanley, the small capital of the Falkland Islands. We are met on arrival and transfer from the airport into town. There is time to explore the town, or enjoy a guided visit to nearby Gypsy Cove which provides our first opportunity for observing the local wildlife, including nesting Magellanic penguins and other sea birds. Making our way to the port, we board our expedition ship, RCGS Resolute in the afternoon. After settling into our cabins and exploring the ship, we meet our expedition team and fellow passengers. Excitement is in the air as we enjoy a welcome cocktail and cast off to explore one of the most remote islands on Earth. This stretch of the South Atlantic is rich in its bio-diversity and showcases an abundance of astonishing wildlife. We are joined by hundreds of seabirds including the wandering albatross. Giant petrels and smaller Cape petrels are also constant companions as we make our way to South Georgia. Photographing these magnificent birds takes patience and skill and our photography expert will be on hand to show you the best techniques. Join the ship’s Captain on the bridge and learn about the operations of our modern research vessel. Throughout the day our onboard experts educate us with a series of presentations about the environment, wildlife and history of the locations we hope to visit in the coming days. History is a key theme of this voyage and the epic story of Shackleton is central to our journey. Majestic snow-covered mountains greet us on arrival in South Georgia. Weather permitting, we begin our exploration on the southern coastline. We hope to navigate the ship into the very historic location of King Haakon Bay. It was here that Shackleton and his men made landfall in their small lifeboat – the 'James Caird', after completing the perilous ocean crossing from Elephant Island, a century ago. This is a very dramatic place, visited by just a handful of ships each season. From here, we make our way around to the more protected waters of the north-eastern coast. We can now indulge in an in-depth exploration, navigating into the bays and harbours the entire length of the island. Elsehul Bay allows for great Zodiac cruising and will be a possible location we will launch the kayakers for a paddle. One of the most anticipated sites in South Georgia is Salisbury Plain. The black sand beaches and tussock covered dunes are home to a staggering abundance of king penguin adults and their young. The rookery is estimated to have a population of up to 100,000 adult and juvenile penguins. This is just one of several such king penguin rookeries on South Georgia. At the height of breeding season, the rookeries are believed to have more wildlife per square foot than any other place on the planet. The majestic ‘Kings’ are not the only wildlife on display as we explore the rugged coastline. Fur seals can be seen poking their heads above the water, the elephant seals enjoy lazing about the beach, while the skuas and giant petrels fill the skies above. Meanwhile, the albatross – our constant companion on this journey – is never far away. Fortuna Bay is a majestic three-mile long fjord. It was named after the ship 'Fortuna' – one of the original vessels of the Norwegian–Argentine whaling expedition which established the first permanent whaling station at Grytviken - further along the coast. History comes into sharp focus as we continue west to Stromness and onto Grytviken. From 1912 until the 1930s, Stromness (and nearby Leith and Husvik), operated as whaling stations and the rusted and ghostly remnants of these old stations seem out of place in such a pristine environment. This area is key to the Shackleton story and it was here in 1916, that Shackleton and his companions, Frank Worsley and Tom Crean, arrived after their epic mountain crossing from King Haakon Bay on the south coast. This is after having completed their 800- mile journey by small boat from Elephant Island in Antarctica. If the weather co-operates, we hope to hike in Shackleton's footsteps, the last few miles across the saddle separating Fortuna Bay from neighbouring Stromness. Eventually we enter the broad expanse of Cumberland Bay, anchoring off Grytviken – the largest of the old whaling stations on South Georgia. A highlight of our landing here is a visit to the grave site of Sir Ernest Shackleton and his loyal right-hand man, Frank Wild. Our next few days take us to St Andrews Bay and Gold Harbour – places that are teeming with wildlife including fur seals, elephant seals and massive colonies of the colourful king penguins. As with all of our landings we will exercise every opportunity to explore on foot with our experienced guides. Gold Harbour is so called because the sun's rays make the cliffs yellow with their light in the morning and evening. It’s an exhilarating location. Drygalski Fjord at the far eastern extremity of the island has been called one of the most spectacular sites in South Georgia and we think you will agree. Our exploration of South Georgia is not over and we navigate our way back along the northern coastline. There are a few special locations we have in mind – including the old whaling depot at Godthul. There is a terrific hike here up to a beautiful lake. Nearing the end of our visit to South Georgia, we hope to enjoy a shore landing at Prion Island – which many consider the jewel in the crown. This location has been designated as a ‘Special Protected Area’ by the South Georgia Government due to the breeding wandering albatross colonies at this location. Boasting the largest wingspan of any living bird, typically ranging from 2.5 to 3.5 m (8ft to 11ft), albatross spend most of their life in flight, landing only to breed and feed. Distances travelled each year are hard to measure, but one bird was recorded travelling 6000 km in just twelve days. We are exceptionally lucky to be able to attempt a landing here as the site is closed to visiting ships between late November and early January, due to the concentration of fur seals on the beaches. The boardwalks provide access to several observation platforms where we view nesting wandering albatross in close proximity. 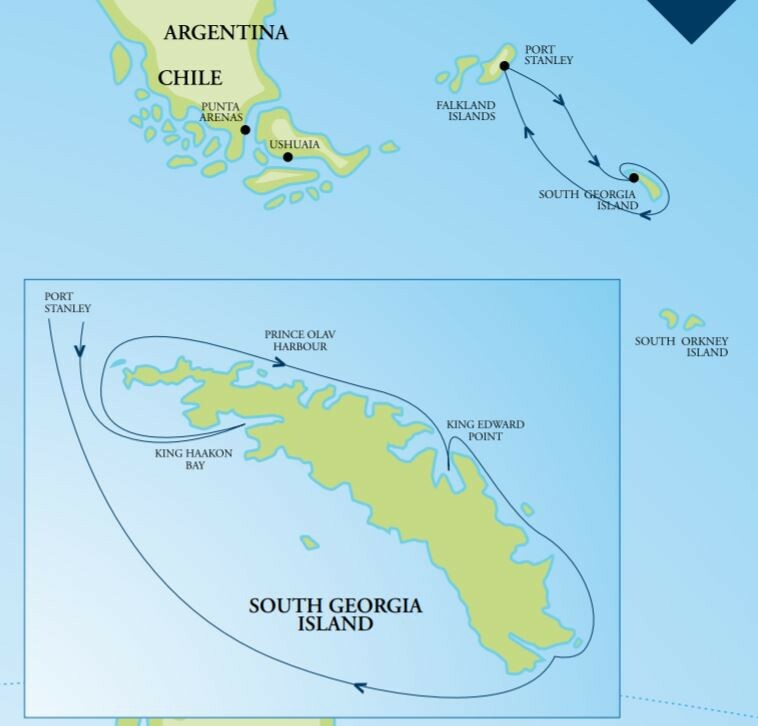 As we depart South Georgia, we pause to reflect on our time in this spectacular location and chart our return course towards the Falkland Islands. Our final days are spent catching up on journal entries, or perhaps downloading and reviewing photos at the multimedia station with our photography expert. For some, it’s a chance to catch some well-earned rest after a busy ten days of exploration. The wonderful lounges on the ship provides fantastic panoramas and are a great place to sit with a book and a hot drink. The educational presentations continue and we enjoy an entertaining and memorable voyage recap by our Expedition Leader. A particular highlight of our return journey will be frequent sightings of the majestic albatross, petrels and other seabirds as they soar above the ship on the winds of the Southern Ocean. Take the time to enjoy a quiet moment on the outer deck and reflect on a truly remarkable journey to the farthest reaches of the planet. We wake to the sight of landfall in the Falklands. Approaching Sea Lion Island, we first note the very barren and windswept landscape, exposed to the prevailing weather that originates in the Drake Passage. Launching the Zodiacs we go ashore to view the incredible diversity of wildlife found here. Three species of penguin including gentoo, Magellanic and rockhopper, as well as southern elephant seals and South American sea lions are known to inhabit the area. King cormorants and striated caracaras are just some of the bird species we may see. As we cruise along the coast of the Falklands, bound for Stanley, we enjoy a special dinner attended by the ship’s Captain. This morning we find ourselves back in the port of Stanley. We say goodbye to our crew and after some free time in town, make our way to the airport for our return charter flight to Santiago. On arrival in Santiago our journey comes to an end. Onward regional and international flight connections may be possible this evening. Discuss the options with your booking agent. A transfer is provided to a downtown location for those choosing to stay and explore Santiago and the delights of Chile. Polar exploration can be unpredictable. Specific sites visited will depend on prevailing weather and ice conditions at the time of sailing. The above itinerary should be read as a ‘guide only’ and may change. The ship’s Captain in conjunction with the Expedition Leader continually review the sailing plan throughout the voyage, making adjustments to the itinerary along the way to take advantage of optimal weather and ice conditions or to maximize our encounters with wildlife. Decades of experience spent exploring these waterways mean we have a large number of outstanding landing sites and zodiac cruising locations to consider, even when the weather conditions may not be ideal or when heavy ice may hinder our planned route. A flexible approach is something we encourage you to bring to the ship. This remote stretch of the Antarctic Peninsula is visited for just a few short months each year. From January onwards, seasonal ice conditions give us our best chance of achieving ......click here to read more. This iconic voyage explores Canada's remote Northwest Passage and stunning fjords of the Baffin Island coastline before crossing Baffin Bay to Greenland where we marvel at the beauty of the ......click here to read more.